It’s that time of year. The holiday season is one of my favorites. It’s all about spending quality time with family, festive evening gatherings, gorgeous decorations all over the city, generosity, and goodwill… A few lovely readers asked about my favorite items to give. I’m not one for gift guides and wish lists, but I figured I would devote a few posts to items I’m looking forward to gifting this season. I’m a perfectionist about most things. I love indulging loved ones. Writing a note of gratitude. Meticulously wrapping beautiful packages and parcels. The art of the well thought out gift. My favorite things to gift have been books and items picked up on my travels. Admittedly, I have a difficult time not instantly sharing books and travel finds. I think Oscar Wilde said it best. I always travel with a notebook. 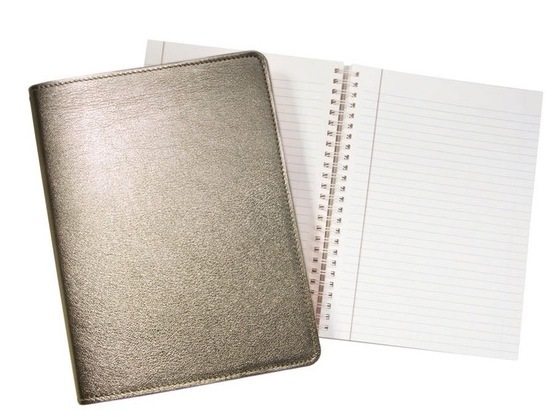 Perfect for quick sketches, endless notes and all the things that come to mind when I have the luxury of quiet. To me there’s something very satisfying about pen and paper. And yes, it’s always fun to go back and read through my notes. The items below are dedicated to the jet-setters in my life. ** Moleskines, along with notebooks from Muji and Archie Grand are perennial favorites that make great stocking stuffers. How is your holiday planning going? I love notebooks so much that I have to keep myself from hoarding them. There are just so many fun and beautiful alternatives out there! I also use a planner/agenda/filofax, despite my love for digital gadgets. As you say, there's just something about putting a pen to paper. Maja H- I know exactly what you mean. I have quite the collection going. So pretty. Love the filofax for staying organized too and yet I'm still a girl whose always holding several digital gadget at once:) I think there's still room for both. That's awesome that you're almost done with the shopping. And isn't spending Christmas with family the best?! I am such a terrible stationery-obsessive that I now own stacks of letter paper and journals which don't see enough use in the age of email! But I still enjoy sending thank-you notes to friends on lovely letter paper picked up in Tokyo, New York, London, Bombay and Jodhpur. Just sent out one this week to a dear friend who gave me the most lovely mechanical old-school watch for my birthday. Can't wait to wear it! My favourite presents to give are usually books, scarves, and jewelry. Ammu- Yes! I'm pretty obsessed with fine stationery and journals. Love sending/writing notes. There are times when an email won't suffice. I always get the most lovely compliments on the notes I send out- it's one of those things that makes people feel very special. I also really like the process of making custom stationery. Would love to make some for my mother. Your mechanical old-school watch sounds lovely. What a delightful gift. Would love to see a picture. I love bringing back scarves and jewelry from my travels for gifts. Lovely picks and taste. So glad to see someone using the Smythson notebook for its rightful purpose- so perfect for you and friends during collections. Your packaging/wrapping/use of ribbons is impeccable. M- Thank you! That's very kind and sweet of you. 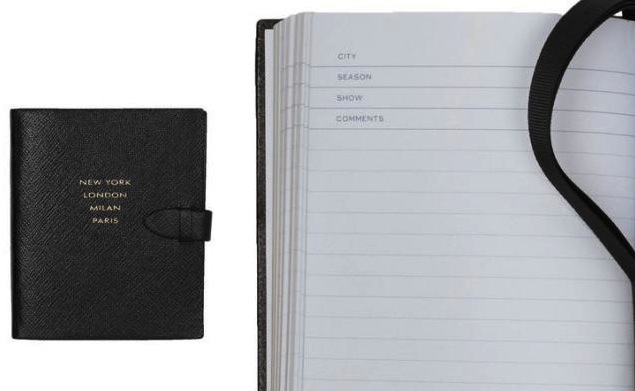 Yes, the Smythson notebook is perfect for fashion month. Would love to gift it with a little note inviting a friend to shows. Love meticulous wrapping and lovely ribbons. I have a Ulysee for 8 years now. I used to write everything in it until I started carrying a smartphone. I'm still very fond of diaries particularly ones with blank pages where I can doodle away. Chocolate Cookies & Candies- How can you not love the Ulysee! It just gets better with age. It's my go-to for work. It's so nice to have something bright to jot things down at my desk. Love that you doodle. I cant resist a good note/sketch book when I see one although I have little use of them anymore, so I end up buying them for my kids to doddle. I am hoping to find some time to start shopping next weekend since work had been busy. Happy Hols to you! Eileen- Happy Holidays to you as well! I find notebooks and sketch books so tempting. Love gifting kids with gifts that inspire learning and creativity. I know exactly what you mean about work- I hope it slows down soon for you. AquaGenie- Hi! It's such a good looking notebook. I love that they did that- so cheeky and useful during show season. I could spend hours in Muji too. So many wonderful things to keep yourself organized. I'll have to try out their pens. miss sophie- I feel like my prayers have been answered. I've been waiting for someone to do this forever! Vanisha @ Vanishas Life In...Australia- Who doesn't love a moleskine. The perfect notebook for jotting down little things that come to mind during the day. What a wonderful gift for your niece's first trip. It's great that you and Patrick are encouraging her to journal her travels. A Smythson is the perfect gift because it's one of those things you would love to receive, but maybe wouldn't purchase for yourself. 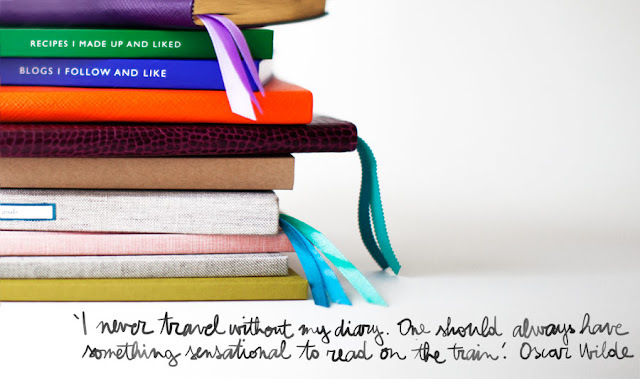 Anouka- So happy to hear from another notebook lover. I love old school stationary shops. I find such unique cards and journals that way. Sootjeelina- I know exactly what you mean. I would be lost without my little notebook. There's always something that I want to write down. S- That's how I feel too. Hope you are enjoying the holiday season! Those Hermes ones are amazing! Sadly there is no Muji where I live, I have heard a lot about their stationary. On another note, just wondering about your Repetto ballet flats. I just got my first pair of Repetto Ballerines and I'm just wondering what kind of sole you get? The only part of the shoe I worry about wearing down quickly is the bit where the sole and toe connect. Do you get a sole put over the original sole? or do you get the entire sole replaced? I have already worn them a bit, and I just don't know what to ask my cobbler. a- Love the Hermes agendas. Muji gets so much right. Congrats on your Repetto ballerines. I love them. What type did you end up getting? The most durable thing would to do would be to add a cobbler add a Vibram half-sole. A good cobbler will mold and custom fit the half-sole onto the current outsole. This way when you'll wear down the half-sole and not the actual outsole. It's fine to wear your shoes a few times before you add the half sole. A skilled cobbler will do some design work to make the half-sole work with the rest of the shoe, since that bothers some people. I don't don't have a full sole put on, because I tend to wear out my shoes in one specific spot. The most important thing is to make sure that you get a Vibram sole. There are others, but Vibram is by far the most durable. I also use a shoe tree for my Repettos since they bend so easily. a.- You're welcome. Yes! I like the sole to blend with the shoe as much as possible. Anonymous- You're welcome! Hope you enjoyed! 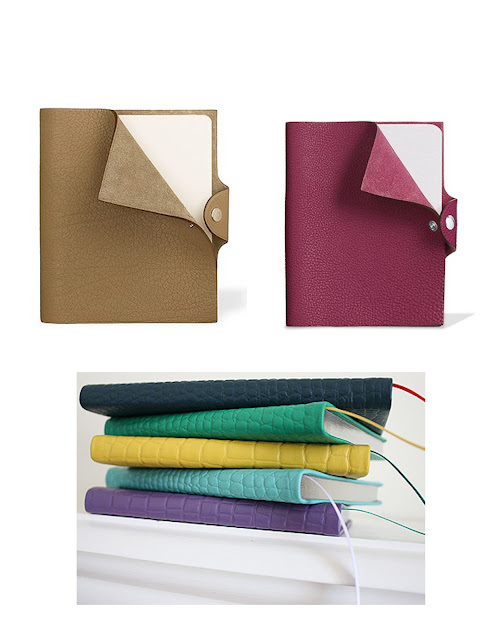 I've spotted so many of these great coloured notebooks everywhere this season! Coach has some really fun colours out as well. They're definitely great gifts for jet-setters to just jot down memories or memorable places to revisit. Now I feel like I should pick one up for myself and my travels! littlemissandrea- They are everywhere! Love how uplifting all the colors are. It's so hard not to pick one up for yourself. Oh how I dream of personalized Smythson stationary! Alexandra- Such timeless and classic stationery. You simply can't go wrong with Smythson. Love moleskines. Totally addicted. And I love giving the tiny pocket sized ones as stocking stuffers. Also a big fan of the notebooks from Muji though, and so nicely priced! Nomadic D.- Moleskines are addictive and the perfect size for the stocking. The Muji notebooks are so great and yes, love the price. Merry Christmas to you. Sue- Thanks Sue! Merry Christmas to you as well. Hope the family enjoys! I love pretty notebooks! These are lovely. Sascha-I think so too! I love how cheerful pretty notebooks are.